Fifty years ago, President John F. Kennedy had a great idea. He would create an agency, the Peace Corps, to send idealistic young Americans abroad to spread their wealthy nation’s know-how among the impoverished peoples of the world. Lately, public schools in the United States have taken JFK’s idea and turned it around. Why not invite the impoverished peoples of the world to come here to enlighten us? America is still the planet’s wealthiest country, but it is no longer, by international standards, a particularly well-educated one. The foreigners come as migrant workers, but, instead of picking lettuce or grapes, they teach science and math. Retiring baby-boomers have created an acute shortage of science and math teachers in public schools. If you’re a school principal, recruiting foreigners from desperately poor countries to come to the United States on temporary visas is a handy way to avoid paying a premium to people skilled in these subject areas who already live within U.S. borders. Perhaps you’ve heard of the bracero (“strong arm”) program, which brought migrant farm workers from Mexico to California and the Southwest for limited periods of time starting in the 1940s. Edward R. Murrow exposed these foreign laborers’ inhumane working conditions in the 1960 CBS News documentary Harvest of Shame. Within five years, the program was shut down and Cesar Chavez was organizing native-born and immigrant Chicanos into the United Farm Workers. The temporary visas that public schools secure for foreign science and math teachers are a bit like the bracero program, except immigrant and native-born teachers in the United States already have two national unions, the American Federation of Teachers (AFT) and the National Education Association (NEA). These are widely believed to exert a stranglehold on U.S. education. But I don’t see how that can be if public school districts are importing foreign labor right under their noses. The unions represent the newcomers as best they can under preexisting labor contracts and try to obtain green cards for the ones who’d like to stay. The presence of bracero teachers is a notable humiliation for the United States, because it suggests that our own citizens are no longer willing to pass on to the next generation the tools necessary to maintain a leadership role in the world. But it has not, for some reason, attracted much attention. A high-ranking AFL-CIO official told me it was news to him. I first learned of the migrants a few months ago when I read in The Washington Post’s Metro section that the Labor Department had levied $5.9 million in fines and back pay from suburban Maryland’s Prince George’s County for ripping off foreign schoolteachers working on temporary visas. Pretty steep penalty, I thought, until I saw that the number of foreign teachers involved exceeded 1,000. Foreign migrants accounted for more than 10 percent of the county’s entire teaching staff! Baltimore, I learned, employed a comparable proportion. A plurality of the bracero teachers comes from the Philippines, the sketchy available data suggests. Labor markets don’t come much cheaper. A 2009 AFT report notes that 40 percent of the Philippines’ population earns less than $1 per day. “I am earning twenty-five times more than what I was earning in the Philippines,” a bracero high school teacher says in The Learning, a documentary about the travails of Filipino migrants teaching in Baltimore schools that aired on PBS in September. 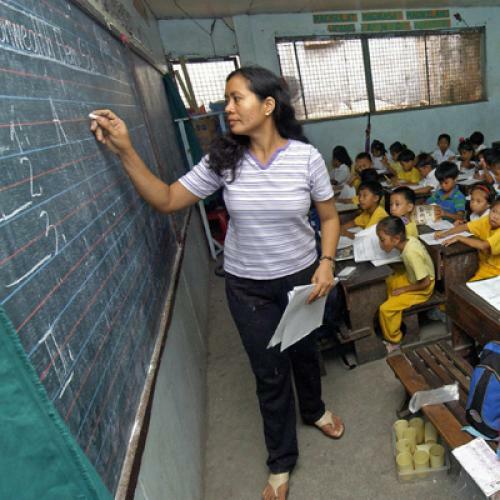 One quality the Philippines is not known for is the excellence of its primary and secondary education system. In math and science, the Philippines consistently ranks at or near the bottom among Asian nations (and well below even the United States). That means, among other things, that the Philippines can ill afford to send its best teachers here. The Learning, which was made by a Filipino-American named Ramona Diaz, is a heart-wrenching film focusing on the anguish four Filipino women suffer in leaving their families behind and the extreme culture shock they face on entering classrooms filled with unruly inner-city Americans. But it’s no Harvest of Shame. By that I mean that—apart from one teacher remarking early on that she paid $7,000 up front to a U.S.-based recruiting firm that is never identified—the documentary sheds no light on whether these migrant teachers are exploited. Nor does the film examine the extent to which the guest workers’ presence undermines the bargaining power of American schoolteachers. The Learning’s indifference to such questions reflects how mainstream liberalism has, since Harvest of Shame, drifted away from matters of economic justice (the very phrase sounds antique) toward celebrating multicultural diversity for its own sake. Nonsense. When 10 percent of a school district’s teachers are foreign migrants, that isn’t cultural exchange. It’s sweatshop labor—and a depressing indicator of how low a priority public education has become. Timothy Noah is a senior editor at The New Republic. This article appeared in the October 20, 2011, issue of the magazine.